How to add arrow shape to the image? From time to time I write a tutorial which would be better if I can provide some images and screenshots with shapes for better visual description. You surely know tutorials with images, boxes or arrow shapes. However I was surprised when I found that this simple function is missing in most of the image editors I use. You can start big Photoshop, home Photoshop Elements, Zoner Photo Studio or any other simple software intended for image viewing and quick fixing, but there is no option how to add boxes or arrow shapes. Fortunately, there is one solution at least. It is free, fast enough and simple. The solution's name is Artweaver. Yes, you probably know this image editor with nice set of brushes. But one of its pros is a collection of arrow shapes. So take your screenshots and open them in Artweaver. There is one small cons that Artweaver is not able to open images when you use drag and drop from a file manager. So you have to use File|Open menu function. Now click the Shape Tool in the floating toolbar on the left. After that click the custom shape in the toolbar which has appeared. Set the Opacity and Anti-aliasing. If you need to put a box to your image, check-off the Filled option (and select the square instead of a custom shape) and set the line width in the Amount option. Then click the select box and select one of the shapes provided by Artweaver. Now you are ready to draw this shape on the image. Try to use several shapes before you will find the ideal for your needs. As soon as you will draw your shapes you will try to find a function for rotating them. If I am not wrong there is no option how to do this using other method than separate layers for each arrow or other shape. So before you will draw the shape/arrow, insert a new layer to your image. You can use Layer|New|New Layer menu function or faster way using Ctrl-Shift-N keys. Then draw your shape. Now use the Ctrl-T keys. 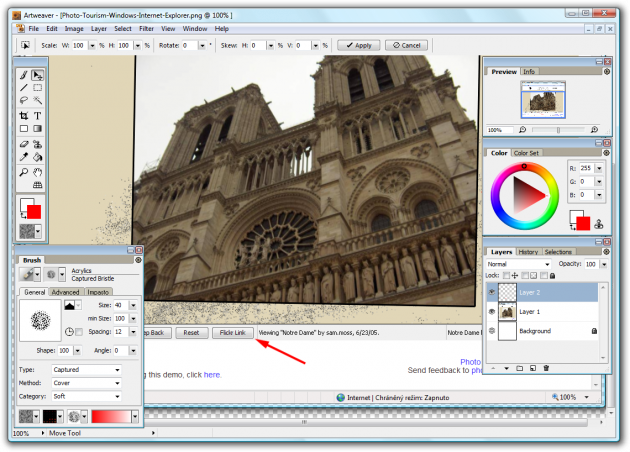 Artweaver will show a new toolbar right below the menu. Click the Rotate field and set-up the rotation angle for your layer with the shape. Then click the Apply button. Now, your image with shapes, boxes and arrows is done and you can save it and upload to your tutorial on your website. I recommend using the PNG file format, it is much better for the screenshots than a JPEG.